Thomas was born in 1894 and lived at the family home at 15, Castle View Terrace, Victoria Road, Boveney. The Bryant family was one of the largest village families, and despite several very early deaths still raised nine or ten children. Five were boys, and it is believed that they were all educated locally and probably attended the Methodist Chapel in Alma Road. Thomas's brother Albert joined the navy when he first left school, and early in the war was listed as a Petty Officer 1st Class. He is believed to have served on H.M.S. Queen Mary, a modern battle cruiser. The Queen Mary was sunk by the enemy in the Battle of Jutland on May 31st 1916 along with 1266 officers and men. There were only about 20 survivors, so if Albert was still serving on the ship he was a very lucky man, as he survived the war. Another brother, Fred Bryant, served as a driver in the Royal Engineers, attached to the Lancashire Fusiliers. Fred was seriously wounded on February 22nd 1917 but he too survived the war. Ernie also saw extensive service abroad with the army at that time. Lastly there was C.A. 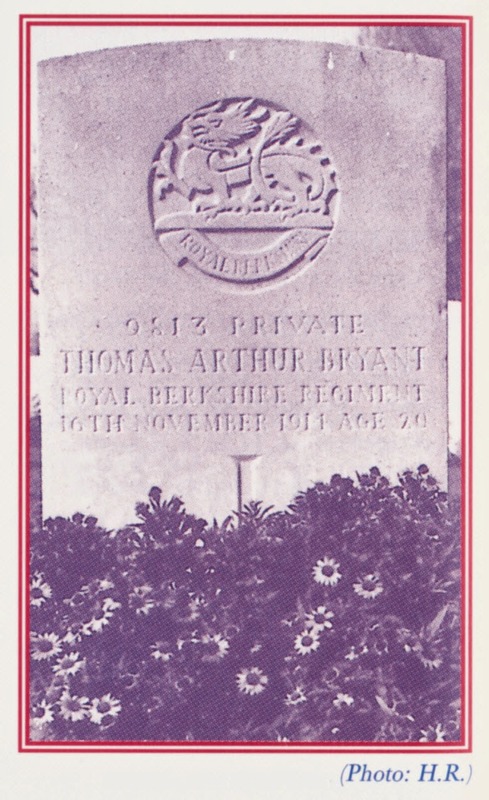 Bryant, known as Archie, born in 1899, who served with the Signal Section of the Berkshire Yeomanry in France. Thomas enlisted in Reading and served with the 2nd Battalion of the Royal Berkshire Regiment for what appears to be a very short time. At the outbreak of the Great War the Battalion was in Shansi, India. It sailed from India on the 16th day of the war and landed in England on October 22nd where it joined the 25th Brigade, 8th Division at Winchester. On November 5th 1914 they landed at Havre. 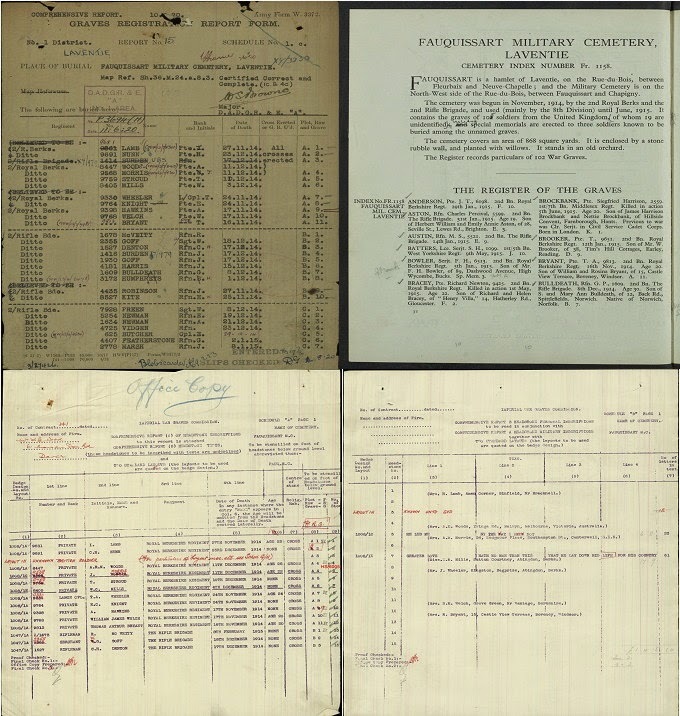 No evidence has been found to suggest that Thomas was a regular peacetime soldier and therefore he probably joined the Battalion when it arrived in England in October. The change of climate affected many of the troops returning from service in the East and Tom was very probably one of the soldiers used to maintain the Battalion strength. Whether or not he joined the Battalion in Winchester, Havre, or some other place we cannot be sure, but we do know that 11 days after the units arrival on the continent, he was dead. He is buried in Fauquissart Military Cemetery in France, situated 23/4 miles S.E. of Levant and seven miles S.W. of Armentieres. Soldiers on the Western Front often had little time to adjust to the front line battle conditions, and Tom was certainly no exception. The Flanders town of Ypres stands about 2-300 feet above the miles of flat country that surrounds it. Because of its strategic position it was destined to be the scene of three long battles which came to be known as First, Second and Third Ypres. The First Ypres was an attempt by the defending British to "turn" the German Army flank. This commenced on October 19th 1914 and lasted nearly four weeks. The battle front extended many miles from south of Armentieres, south of Ypres, to beyond Langemarck, north of the city. It was nearly three weeks after the opening shots of the battle before the 2nd Royal Berkshires took up positions south of the line. Opposing them were units of the German 6th Army. As a final strike in this Ypres battle, the enemy had planned a massive assault to take place on November 10th 1914 against the centre of the line, and simultaneously intended to apply strong pressure in the north and south. In the event the attack was postponed for one day as preparations in the south were not satisfactory. The night of November 10/11th passed quietly with no indication of the assault to come. At daybreak a hurricane of shells struck the British trenches, forcing the defenders to crouch low and to wait. The attack itself was not a success, but this was to be Thomas Bryant's last day. We do not know whether he was killed in the early morning pre-assault barrage, or whether he died during the attack that day. The next three days were fierce with the German attackers sustaining 12,000 killed. The fighting exhausted both sides, and three days later, on November 15th, the assault ended. 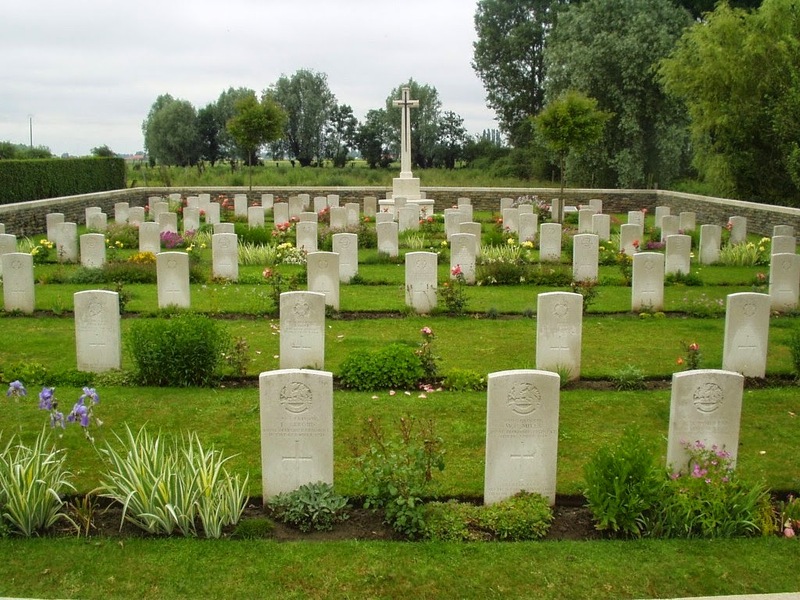 Fauquissart, where Tom is buried, is a small cemetery containing 105 graves, all of United Kingdom soldiers who were killed in the area between November 1914 and the following year. Most of the men had belonged to the 2nd Royal Berkshires or 2nd Rifle Brigade. Tom's grave is number 11 in row A. He was Eton Wick's second war fatality; he was a single man and aged 20. He is commemorated on the Eton Wick War Memorial and on the tablets at the Eton Church Gates.